WASHINGTON — The military campaigns in Iraq and Syria have taken 45,000 enemy combatants off the battlefield and reduced the total number of Islamic State fighters to as few as 15,000, the top U.S. commander for the fight against IS said Wednesday. Lt. Gen. Sean MacFarland said that both the quality and number of IS fighters is declining, and he warned that it is difficult to determine accurate numbers. Earlier estimates put the number of Islamic State fighters between 19,000 and 25,000, but U.S. officials say the range is now roughly 15,000 to 20,000. 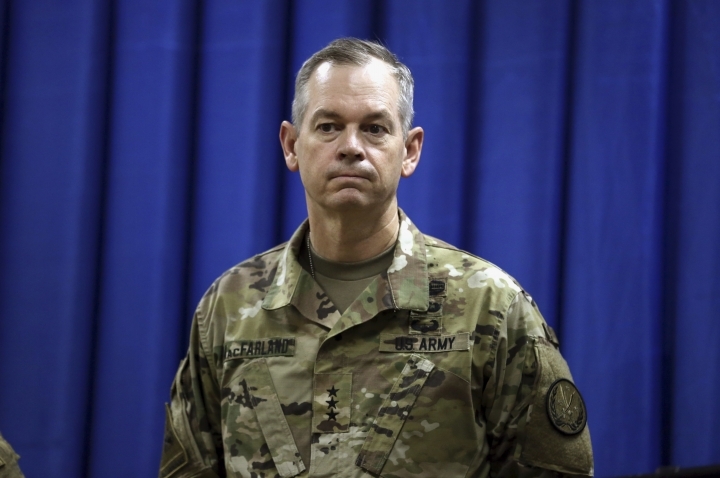 Saying that "the enemy is in retreat on all fronts," MacFarland said U.S.-backed local forces in both Iraq and Syria have been gaining ground. And he said the flow of foreign fighters into Iraq and Syria has decreased and that many people pressed into fighting for the Islamic State group are unwilling or untrained. "All I know is when we go someplace, it's easier to go there now than it was a year ago. And the enemy doesn't put up as much of a fight," he told Pentagon reporters in a video conference. MacFarland said Syrian democratic forces are on the brink of defeating IS in Manbij, Syria, in a matter of weeks. The city, he said, is largely in the hands of the Syrian democratic forces and the pockets of enemy resistance are shrinking daily. "I don't give it very long before that operation is concluded, and that will deal a decisive blow to the enemy," he said. Asked how long it will take, he said possibly a week or two, but noted that there are still a lot of enemy foreign fighters there battling hard to keep control of the city. MacFarland said that Iraqi forces are in a position to begin to retake the northern city of Mosul. But he added that the U.S. still has quite a bit of work to do at the Qayyarah Air Base in northern Iraq before it can be used as a hub for the battle to retake Mosul. President Barack Obama authorized the deployment of 560 more U.S. troops to Iraq to help transform the air base into a staging area for the eventual battle to oust IS from Mosul. The group has held Mosul since June 2014 and has used it as a headquarters. The U.S. troops will include engineers, logistics personnel, security and communications forces. Some teams of U.S. forces have been in and out of the base to evaluate it and the work that must be done, but officials say large numbers of troops have not yet arrived. MacFarland cautioned that while there have been successes in both countries, IS will continue to be a threat. "Military success in Iraq and Syria will not necessarily mean the end of Daesh," he said, using an Arabic acronym for the Islamic State group. "We can expect the enemy to adapt, to morph into a true insurgent force and terrorist organization capable of horrific attacks like the one here on July 3 in Baghdad and those others we've seen around the world."